I have been home from vacation for 2 1/2 weeks and I am finally getting the last of the reviews up! My 7th vacation read was The Fallout by Tamar Cohen. It wasn’t what I expected, but it was still good. The Fallout is the story of what happens when one of two couples who have been friends for a long time break up. Josh and Hannah are married with a young daughter, and their best couple friends – Dan and Sasha – have grown to depend on each other for friendship, for backup child help, for long lunches that extend into dinner – for all of the things that adult friends expect from and give to each other. They are shocked when Dan announces that he is leaving Sasha, and even more shocked when it turns out he’s already seeing another (younger) woman. The Fallout examines – in great detail – how Sasha and Dan’s breakup affects not only their individual relationships with Hannah and Josh, but also Hannah and Josh’s own marriage. Sasha is devastated, leaning on Hannah for emotional support and rallying Hannah in her campaign to malign Dan, while Dan seeks out Josh’s support and confidence as he grows more and more impatient with his increasingly unhinged wife. I was expecting domestic drama – analysis of these relationships and how they changed through the strain of the breakup. What I wasn’t expecting was a psychological thriller, where the tension ratchets up throughout the book and you never know what outrageous thing is going to happen next. Instead of simply being weary and conflicted, Hannah and Josh become victims of increasingly disturbing intrustions in their lives. Who’s behind the nefarious stunts – and does it have to do with Sasha and Dan? Will Hannah and Josh’s marriage survive the strain? The Fallout was a page-turner, to be sure. If you’re looking for relationship fiction, be warned that there is something more sinister at work here. It was a decent read, though, and with a few weeks’ distance, I am surprised at its staying power. I especially enjoyed Cohen’s observations about marriage and parenthood – all pretty spot on. Posted on August 3, 2018 by gayle. 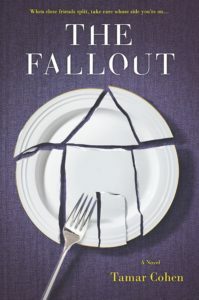 This entry was posted in Fiction and tagged divorce, psychological thriller, tamar cohen, the fallout. Bookmark the permalink.